Hello everyone! Today is My Pink Designer Day!! Today's projects highlight Robyn's new stamps. I used Music Speaks. I added pop dots between the 3 layers to give it some dimension. This is a great stamp set! Make sure to visit My Pink Stamper to see all the design team's wonderful projects and to find out where to purchase Robyn's amazing stamps!! Hi everyone! Thanks for stopping by for another Fantabuous Cricut Challenge Me Monday post!! This week, you need to Emboss It! Any kind, dry or wet. I used my Cuttlebug and a matching embossing folder to go along with my cartridge today. I cut out a blackout cut of the base layer and used pop dots in between to add a little dimension. And make sure to check out My Pink Stamper's Blog to see where you can purchase her stamps--her newest ones are really great! I love the colors and feel of this card. Great job! And it looks like I'll have another giveaway soon!! Welcome to the My Pink Stamper Pink-alicious Blog Hop!! If you have come from the awesome Agnes aka Flowerdisco, you are on the right path. If not, make sure to start at Robyn's blog HERE. For tonights hop, we are showcasing Robyn's new stamp sets, using the color black plus our favorite color. My favorite is pink and I used the Music Speaks set. This set is perfect to use with the Quarter Note cartridge. I was really pleased at how the card turned out and hope you like it too! So I have some blog hop candy for you!! 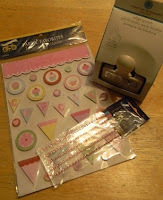 Just leave a comment and a way for me to contact you and you could win My Pink Stamper's Everyday Life set! WINNER HAS BEEN DRAWN! But if you want some of Robyn's awesome new stamps, make sure to visit her blog to see where you can order them. Now hop on to Angela’s Simple Creations to see her wonderful project and for the next stop on the hop. 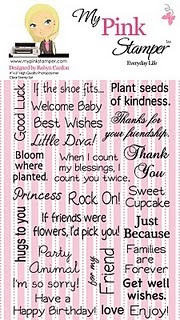 And be sure to head back to the My Pink Stamper blog when you are done to link up your own project with your favorite color and black to join in the fun! Welcome to Crafting Cricut Mom and the fourth Fantabulous Cricut Crawl...Fantabulous Cricut's version of a blog hop! If you've come from visiting Erin at Spantastikreations , you're in the right place! If you've just happened across my blog and would like to play along with our Fantabulous Cricut Crawl, start HERE . For my project, I made a quick Lots of Love book using my Your Story Photo. I used a large dot Cuttlebug folder to emboss the 4 x 6 cover. I cut different shades pink pink cardstock at 4 x 6 to fill the inside. The cut is from Birthday Bash at 3 1/2 inches. I tied twine from The Twinery around the cover and added some self-stick gems. I'm not sure if I'm adding pictures to the inside to just use it as a notebook. I do have blog candy for you!! But I'm having internet issues and will post a photo later. Here's a picture--sorry for the bad quality, I am having multiple technical issues! I have a Martha Stewart Cupcake Edge Punch, A Little Yellow Bicycle Cupcake sticker pack and a package of self-stick pink gems. To enter, please leave one comment and a way for me to contact you if you win! I will draw a winner this weekend. Now it's your turn! Let's see your Share the Love projects! Make sure to include a Cricut cut somewhere on your project and the word Love! Next stop is Jamie's blog, Cute Cards & Crafts by Jamie. Go see what she has in store for you today... And when you're done, make sure to link up your project to FCCB's Fantabulous Cricut Crawl post to be entered into the contest! You can go to My Pink Stamper's blog to see where you can order her 10 new sets from!! Here's a card with a stamp from the new Music Speaks set. Make sure to visit My Pink Stamper's blog to see all 10 and where you can order them from! Stop back by to see some more samples this week!